Successfully Added Digital Video Memo - Cool Gadget to your Shopping Cart. Throw away the sticky notes and embrace the 21st century. This Video memo gadget recorder is the perfect way to record a video message just encase you need to pop out, or just need to leave a message for your misses before you leave to work. This video recorder gadget features a built-in video camera and 1.4 inch LCD screen, MIC and speaker that all contribute to producing a vibrant video and audio playback. When there’s a message stored, the LED light shows up, so there’s no excuse for anyone to miss your message. To operate this video memo, look into the camera lens, press record and start talking, you have 30 seconds to say what you want after which the video memo recording will automatically stop. This video memo gadget is designed to record one message at a time, each time a message is recorded, it overwrites the previous message, this way you don’t have to worry about scrolling or navigating through a complicated menu system to find the messages. So, put the pen down, save a few trees in the process and use this eco friendly video memo gadget. This amazing cool video memo gadget is brought to you by the leaders in wholesale factory direct china electronics, Chinavasion. Click "Add to Cart" now and we'll express ship you a sample to see for yourself how great this video recording memo gadget really is. Note: This great new product is available with no MOQ (minimum order quantity) for a limited 60-day run. After that it, it will only be available for orders with a MOQ of 2 units. .
Push one button to record and another to playback - it's that simple. RED record buttons flashes when recording, and when you have 5 seconds left you, are informed on the screen with a countdown from 5 to 0. How can I access the recorded video file on the video memo gadget? First make sure the device is switched off. Your computer will not recognize the video memo if the device is connected to your computer when it is turned on. 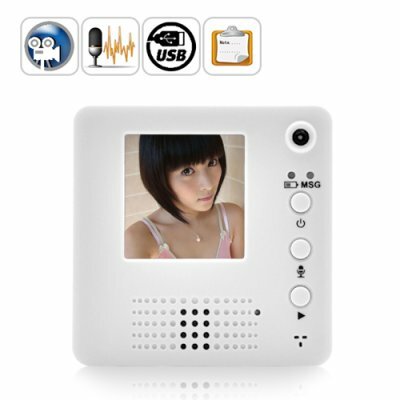 on 2010-11-16 01:06:30 This product is simple to use and also convinient for office and home! When first I saw the item, I was amazed about his description. After I was thinking how to help CHINAVASION promote it in Russia. So, I have ordered 2 items , 1 is for my home , the second one is for presentation in an HR-company where my friend is a chief. I think the item gives a really feeling of the 21st century when some one uses it daily. So, Both my menage and friend told me that I would order a robot next time! I would do this if Chinavasion did it!